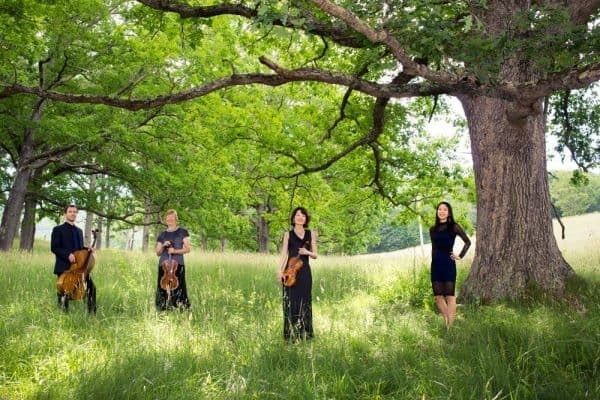 Washington and Lee University kicks off its 2018 Concert Guild season on Jan. 19 at 8 p.m. with the Garth Newel Piano Quartet in the Wilson Concert Hall. The concert will open with Louise Héritte-Viardot’s “Piano Quartet No. 1 in A Major,” also known as “Im Sommer” (In Summer). A programmatic work, each of its four movements bears a subtitle that depicts an aspect of life on a summer day. Mark Carlson’s “Piano Quartet” will follow. Born in 1952, Carlson is a Grammy-nominated freelance composer and adjunct professor of music theory and composition at UCLA’s Herb Alpert School of Music. Composed after the death of his closest friend in 1990, the three movements of the “Piano Quartet” portray Carlson’s emotions as he dealt with the grief of that loss. The concert will conclude with a performance of Gabriel Fauré’s “Quartet No. 2 in G Major, Op. 45.” Words such as “passionate” and “violent” often describe Fauré’s second piano quartet, in which the composer demonstrates his prodigious talent for expansive melodies and innovative chord progressions. Tickets are required and available through the Lenfest Center Box Office at (540)-458-8000 or online at https://www.wlu.edu/lenfest-center.